Founded in 1955, Shemin initiated 'one-stop' horticultural distribution centers in the United States, providing fresh nursery stock to landscape contractors and not to the retail public. 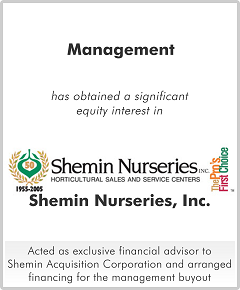 At the time of this management buyout, Shemin remained the largest wholesale distributor with approximately $70 million of revenue.Weyerhaeuser Company had purchased Shemin from the company's founder, Manny Shemin, when it attempted to consolidate a portion of the nursery industry. At the time of the management buyout, Weyerhaueser had changed strategy and was divesting its nursery businesses. Shemin's management had a desire to stay with and continue to grow the business. Management co-invested with a private capital source to obtain a significant equity interest in Shemin. This management buyout was financed through a senior secured revolving credit facility and term loan and a securitized real estate term loan.